I have been obsessed with clearing my art drawers. Deciding what I will work on and what gets cut up to fill creative clipping bags. Once I began painting on old ghost prints and embelishing the old images with more color and detail I have been totally absorbed in the process. I told myself that I can’t do new work until I resolve and move these older pieces on. What am I saving them for?, This was my question. Come to find out, I love painting. I can’t stop. I don’t want to stop. When I come out of the studio it is hard to switch gears because I am in total “art head”. Making decisions and follow through with the art is all consuming. It is hard to leave the works in process and attend to life outside the studio.I love how the paste paint looks on the ghost prints. It is like magic. Here is a little sample of a paste paint print. I will demonstrate this process at the annual Ashland Studio Tour, October 10th and 11th. I am obsessed and absorbed with working on these pieces. I am gluing them on to wood and layering wax on top giving them a wonderful glow. I will be displaying them on the featured artist wall upstairs at the Ashland Art Center in August. I have been obsessed with my art lately. Yes, more than usually. It all started when I promised a “Creative Clippings” bag to a customer. These are 6 X 9 plastic bags filled with bits of prints, bits of paste papers, cards, card flyer images, and a variety of things from my studio for collage, scrap booking, and art projects. Before creating the bag for the customer I went through all my drawers and art bins culling prints and ghost prints deciding which pieces I wanted to draw or paint on, which pieces will become book covers for my handmade books, and which pieces will end up as part of the “Creative Clippings” bags.I knew that I was avoiding creating new monoprints. Still, I needed to clear the drawers and I needed to make some Creative Clippings bags. Sometimes I have to clear the decks before new work can come through. So this is my excuse to myself for not creating new images.I separated the ghost prints that I wanted to work on. Some of these prints I have saved for sixteen years. Ghost prints are the second, third, or fourth monoprints that are printed from the same plate, each print becoming lighter and ghostier. I like the ghost images for many reasons. I like working on the ghosts because I can take the original idea of the first print to another level or I can take the original idea and completely change it. The piece becomes less of a print and more of a drawing or painting or a mixed media piece. I find this very freeing and a lot less pressure than creating new monoprint images from scratch.About five years ago, by accident, I discovered that using paste paint on top of ghost images creates a unique and vibrant piece of art. Paste paint is acrylic paint in a paste medium. Generally paste paint is used for making paste papers with patterns and surface design used in book making and other projects. I have made and used paste papers in the making of my books for close to thirty years.I have been working for two weeks solid everyday on six ghost prints. First I painted on them with the paste paint creating atmosphere and some surface design. This process is bizarre and also magical because I lay lots of colored paste over the print. I hand press carved stamps onto the print. Lastly I paint a layer of black paint over the entire print. Once this is done I scrape all the paint off and see what is there. It is hard to describe. I may do a demonstration of this process during the next annual Ashland Studio Tour that will be held October 10th and 11th. I will keep you posted on this.Next I began painting details using gouache and paste paint. I have been enjoying this process a lot. I carefully paint the details and add elements that were not in the original monoprint, sometimes pulling ideas from forty years ago. I have felt really good about working on these unfinished pieces of art. When there is an excess of work in my art drawers I feel weighed down by them. The obsession comes from not allowing my self to print anything new until these are finished and when I am away from the studio all I think about is getting back to these works. Once the paintings are finished I glue them on to wood panels. Next I coat the paintings with bee’s wax. I have four of the six completed and will be showing all these pieces at the Ashland Art Center for first Friday, in August. I will be the featured artist for the month of August. I will be showing the new work at the top of the stairs.Since I had the bee’s wax heated and ready I have been re-working some older pieces and working on some new encaustic pieces that are on display upstairs in my studio #8 at the Art Center, just in time for the First Friday Art Walk this week July 3rd.I have been so utterly focused and absorbed by all these art pieces that I am barely aware of anything outside of my studio. When I do come out I can barely carry on a conversation much less decide what is for dinner. I call this state of mind “Art Head”. I know that I am missing a lot of great things happening in town and with my friends. This is the price of “Art Head”. Hopefully my friends and clients will understand. I am loving being in the “creative can’t stop mode”. More on the “Creative Can’t Stop Mode” next time because right now i have to get back to the studio. One of the things I really like about working in the Ashland Art Center is being in community with other artists. Another thing I like is meeting and talking to the visitors who come through, especially if the visitors take the time to see and experience my work. An Artist’s life usually means lots of hours spent alone in the studio. I do get plenty of time alone working in my home studio. This time is important and essential to my process. So, it is nice to visit with people who come through the Center. It is the one thing I liked about doing art fairs and the one thing I miss about doing art fairs is talking to and meeting the people who buy my work. When I am at the Art Center I work on projects like making books or drawing that I can do while people are watching and walking in and out. This summer has been particularly slow for me with regard to visitors and sales at the Art Center. This creates all kinds of worry for me. I worry that I have saturated the market with my work. I worry that people don’t like my work anymore. I worry that people are buying on the internet and not in person. I worry that I have too much art work that hasn’t sold. The Art Center is unique in that you can look at art and you can talk to the artists who are working. You can see works in process. You can do this 10:00 to 6:00 everyday. I try to make my studio space comfortable and calm, a nice place to visit and to be. I like being off the beaten path, but there are lots of people who don’t make it all the way to Studio #1 because it is far from the front door and out of the way. People have to go through a lot of other art and mirrors to get to me. I try different things to make my space more attractive. I rearrange the furniture. I rearrange the art. I bring in new work. I have made new signs. Maybe sales are slow because it is hot outside. Who wants to be out and about when it is this hot? Thankfully it is nice and cool in the Art Center. I wonder, is it me? Is it the weather? Is it the Center? What can I do differently? Where is everybody? Is it time for a change? Last week while I was working in Studio #1 and pondering all of this I had a visitor from Washington state. We connected right away, in fact I felt a genuine kinship with her. As promised she returned with her husband and three lovely friends who I also felt a genuine and strong connection to. 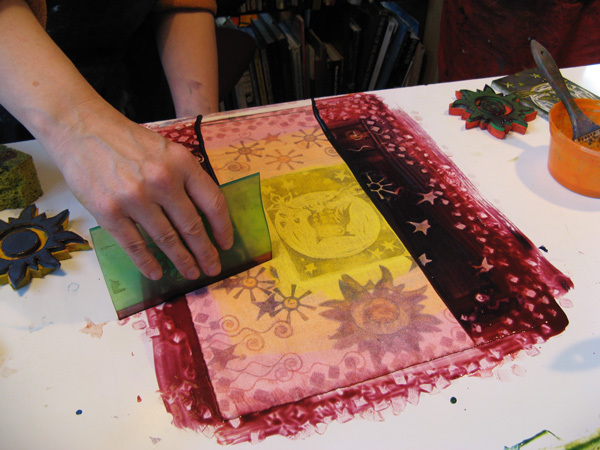 Her husband has just begun learning about and doing mono printing. There is nothing I like more than talking about the process and magic of mono printing. Even if they hadn’t bought several handmade books and several original works of art from me, I was happy to meet them all and now call them friends. I am grateful for their generosity of spirit in taking the time with me and my art. Thank you friends. Making connections with people who enjoy my work whether they buy from me or not restores my sense of purpose and well being and reminds me (especially during slow times) that what I am doing is important on many levels. When I go through dry spells it is amazing how quickly I can adopt the way of the worrier. I guess I need to make a connection with people. My artwork also needs to make a connection. In the past month I have asked myself “would I still make art if I never sold anything”? I say yes because it is my conversation with my self and the universe.The images and the stories they tell are gifts for me and for others who take the time to see. I do like sharing my art. And the fact is, I love art making. I love the conversation. Thank you to all of you who have supported me and my work. I am grateful for every sale no matter how small and I am grateful for everyone who has taken the time to see my art and strike up a conversation. Lately I have been thinking a lot about doubts and how I create when I have doubts. Having doubts is part of the process of creating. It is also part of being human. I believe people think that I always know what to do when I am creating a piece. I don’t. I used to say creating is about deep listening and follow through. This is still true, but there is more. Creating a work of art is like figuring out a puzzle. It is coming up with the right pieces and fitting them together in the right way so that it fits together to make a whole story. Sometimes I don’t have a clue as to what to do. The trick is to not be intimidated by not knowing. Once I have created my monoprints and printed them on paper, there is still work to be done. I would say that most of my monoprints require more work, like drawing, painting, or collage. Sometimes they become encaustic wax pieces or they become covers for my handmade books, or they end up as parts of my Creative Clippings bags. I usually pull at least 3 monoprints from the same plate. Each one is similar yet different. Sometimes these monoprints tell different parts of the same story and sometimes they veer off into a new story altogether. I do not control or steer the art. 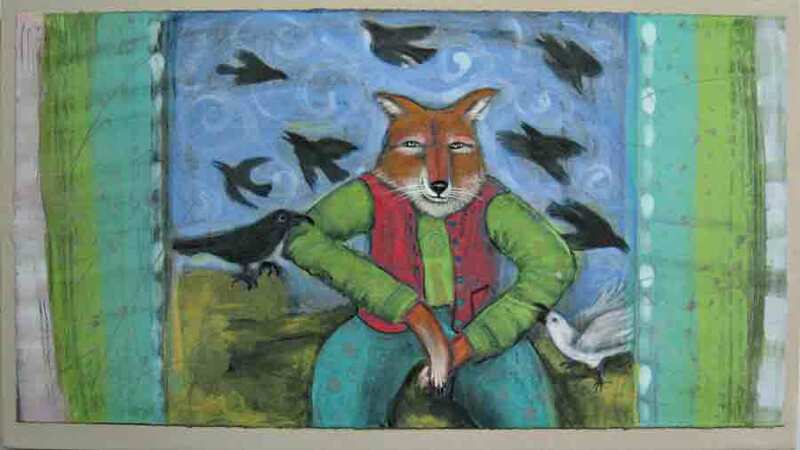 At first when I choose a monoprint to draw or paint on, I try to figure out how best to bring out the story or image. The big question is what to do? What is this piece about? I have no idea. So I sit with the unfinished piece waiting for inspiration or a clue. I can get very antsy and uncomfortable, and I wish I were anyplace but here with this piece of unfinished art. Sometimes this is excruciating. There is a lot of sighing on my part and I usually reach for chocolate, which helps by the way. It is a process I have gone through probably thousands of times. But I stick with it and here is why. I override my doubts and fears of screwing it up and I begin. It doesn’t matter where on the piece I begin. It could be on the far edge of the print that isn’t critical to the piece. The important thing is to begin. Pablo Picasso said “inspiration exists, but it has to find us working“. He is correct. You can’t just sit and wait for inspiration. You have to take some kind of action even if it is just a tiny mark or step. So, I start drawing and shading, or painting. I usually know right away if what I have done is not right and I back up and erase, or re-paint with a different color. Then there is a tipping point. I have taken enough right steps or found enough of the correct puzzle pieces that the image begins to take shape and I suddenly know exactly what to do. It is a glorious feeling to get past the doubt phase. This is the cool part, because what happens is that my hands begin doing things before my mind has decided what to do. Athletes describe being in “the zone”, this may be similar because the feeling is luminous and timeless and worth every minute or hour of the uncomfortable doubt phase. In my printing process one thing leads to another, as in the example image above. The image on the left is created with black ink and printed on a sheet of my handmade paper, all the color is from the handmade paper. In the next monoprint I have added blue ink to the image on the plate and then I rolled a rainbow roll of red and yellow ink. I have also re-shaped the image using Q-Tips and a small hand roller. the third monoprint has more drawing and wiping the ink away with Q-Tips. I have also added stamped images. Each monoprint is unique and has a different feel from each other. For a good demonstration of me working check out this 9 minute Art Beat Video (over on the upper left). I have just described how I made these monoprints. Now I am going to describe how I really make monoprints. Being in the present moment is key. It is only in the present moment that I can be in a state of allowing. I am allowing a connection or conversation to occur between my art self and the universal field around me. Sometimes this universal field is just what is in my emotional or feeling body, or my heart. Sometimes this field is my studio, my property, the city of Ashland, the Northwest, North America, the northern hemisphere, the world, or, the universe. I never try to control or guide what happens. I am in a state of sacred trust. in the ink on the plate using various tools. Sometimes this part takes a while, sometimes it is fast and truthfully it is not comfortable. This is when my brain kicks in with a multitude of things I really should be doing. But I am steadfast. I have been here thousands of times and I know what to do. I breathe deep and come back to the present moment. It is a practice, like centering or clearing the mind as in meditation. The only thing that exists is me and the ink and I continue making marks until a shape or the curve of a line catches my attention. I am in a state of deep listening for the gesture, for the idea, for the animal, for the intuitive spark that will lead me. I follow the illusive thread of an idea wherever it leads. It is a slow and uncompromising process and it is my job as an artist to stay out of the way so that the image comes forth. What I mean by this is that I stay out of my head allowing the image to arrive and tell its own story. I then do my best to draw out or manifest the image that is beginning to appear. What is this image? What does it want to be? What is the character holding? What does it want to wear? I proceed by feel. If what I do feels correct in my body or if I like it then I know I am on the right track with what is emerging. If it doesn’t feel right I back up and try something else. Fortunately monoprinting is very forgiving and I know that I can always re-work it later once it is printed. I know this work comes through my heart and hands and my artist filter, but I believe that my art has a voice that is independent from me. The work is a collaboration. Most all of my monoprints are created in this way I trust the art that comes. It is important for my well being. In these troubled times my art is a balm for my soul and I am glad to share it. 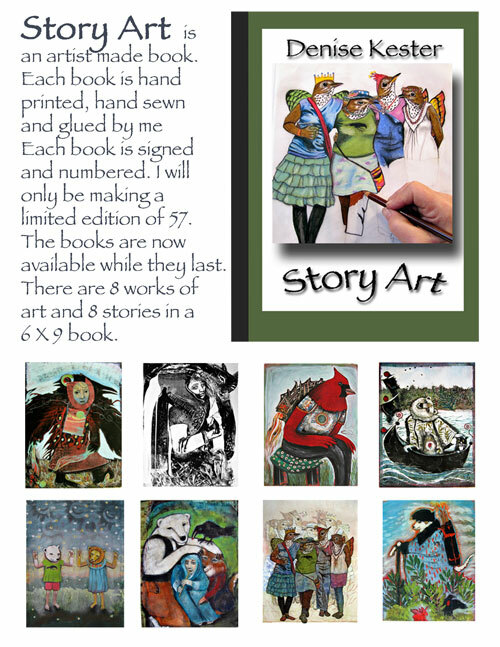 Creating art and art stories is my medicine and practice. 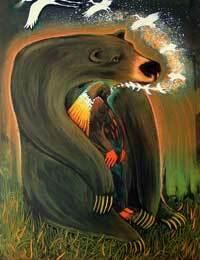 The storyteller tells a story so powerful strong that he turns still-water into a rushing clearwater stream. Through his conjuring words and his graceful movements he calls to the salmon people to come forth, and they do. His story restores the balance for all creatures who hear, see, and experience it’s telling. Watch this, see what is reflected in my eye? Hey, I’m over here, are you listening? What is in your peripheral vision? See the landscape mirrored in my eye? On a recent Sunday my husband and I were installing my new old Griffin etching press into my studio. The press weighs about 600 pounds, so once I decided the placement this is where it would stay. No pressure. Just when I settle on an inch here, an inch there and I say “I think this is good” my cell phone rang. Even though I was right in the middle of making decisions and cleaning the studio and moving furniture to fit the press in, and my husband was looking at me like “okay now we have to get the press off the rollers” and the music was rocking, I answered my phone, which is not something I would normally do when I am busily engaged in a project. The woman on the line said her name was Robin and that she was trying to place an order on my web site but she coudn’t get it to work. I asked her what part is not working and tried to pin point the problem. She began to cry. I turned off the music and held up my hand as a signal to my husband that I needed to deal with this call right now and the press would have to wait, even though I had waited two and a half years for this press. Robin told me that she was in stage IV cancer and was in hospice care and that she just couldn’t seem to follow the steps to complete the order. She shared with me how much she has loved my work and that my images made her less fearful about her death. She said that she had a little money left and that she wanted to buy my work to give as gifts and thank-yous to the people she loved and to all the people who had helped her through this dying process. She wanted me to send the prints and cards overnight to Portland where she lived. I told her that I could do that and she gave me her order over the phone. She placed a large order and said that the giclee print of “She Let Her Words Fly Forth as Blessings like White Birds Cheering the Heart” (above) is one that she was keeping for herself because it makes her feel safe and held and had a healing quality that spoke to her heart. I was feeling choked up and very honored by what Robin was sharing with me. I asked her if there was no chance to beat this cancer and she says not at this point, there was only a little time left to her. When she said this I suddenly saw her surrounded by luminous beings with their arms outstretched waiting to catch and help her. I had only known Robin for fifteen minutes but I saw this image in my mind’s eye very clearly. So, I believe her. I told her about the vision I saw around her. She got teary and I got teary. I told her that I would get the order in the mail the first thing in the morning. We said our heartfelt thank-yous and goodbyes. When I hung up the phone I knew that I was going to drive to Portland even though I couldn’t afford to take the time but I knew in my heart that I couldn’t afford not to. I wanted to make sure that the order got to her safely and the only way I could be sure of that was to take it to her. It took me the rest of the day to print out the giclees and to assemble the order. I would drive up Monday and back on Tuesday because I had to get the studio ready for a class on Wednesday. I called Robin the next day and she was immediately concerned about the order. I told her that instead of sending it I was going to deliver it to her. She was relieved and so happy. She was worried that she was going to die before she could make sure the art work went to the right people. I couldn’t leave Ashland before 3:00 but I would do my best to get there between 7:30 and 8:00. This would work for her. On my drive I reflected on all the times lately that I have been thinking “Does it really matter what I do? Does what I do really make a difference?” This past year was the busiest year I have ever had. And I can really stress out trying to get things done like shows and deadlines, new art ideas, working time at the Ashland Art Center studio, time working at my home studio, teaching, home life, walking. And when I am tired I think “why am I doing it?” Then I got a call from Robin and I know why I do the work I do. I am so humbled by her situation and the fact that one of the last things she wants to do in her life is to buy my work and give it away to her loved ones. What a gift she has given me. I will remember this. I asked her how she knows of my work and she says that her counselor has several pieces of my work in her office and that her counselor saw me on Oregon Art Beat. We just can’t know how the little things we do will affect people or when. That Art Beat segment was 4 years ago. I made it to Robin’s apartment between 7:30 and 8:00. Her best friend and care-giver Theresa was there and they both welcomed me like an honored guest. But I was the one blessed to be allowed in to this very private life and death event. I didn’t know what I was going to say to her but I wasn’t worried about it. I just knew that being fully present and just showing up is enough. I gave her a gift of a Story Art book. I wanted to give her something new so that she could enjoy it for as long as she had left. She was thrilled with the gift and she gave me a gift of a small carved wooden bear. This meeting for the first and last time was very poignant. Robin told me that when she is on the other side that she will be an advocate for me and my work. I thanked her for that and we said our heartfelt goodbyes and soul-to-soul thank-yous. Robin lived for another six days and she was able to give all the art work to her loved ones, including a personal note that accompanied each piece. For someone I had only known a week she has had a huge impact on my life. I am humbled and awed by her affirmation of me and my work. Thank you Robin Hall you have blessed my life and I am grateful to have known you. I just got back from a wonderful trip to Georgia. It included family, friends, and book making classes. I also attended Peggy Rubin’s Sacred Theatre in Atlanta, where I facilitated a collage and writing exercise. The collages were all perfect for each participant and the writing was astounding. I was not surprised. When given the chance to be creative, people are creative. What if I make something amateurish and everyone judges me. What if I fail miserably, it is better not to even try, because then I will be safe. Everyone else knows what they are doing. “You must do the thing you think you can not do.” I often think of this when I am scared or reluctant to do something. This feels really really (really) important; to do the thing that I think I cannot do, even if I make a mistake. Because for me it is a worse feeling not to try than it is to try, no matter what happens. When I do something that challenges me I feel alive and connected. I say to my students, “When you do art, there are no mistakes, they just lead you to new possibilities.” I will tell you a secret. But, I do know what feels right and what doesn’t feel right. This I know is true. Through practice I have a strong and unbreakable trust for the creative process and for the communication that comes about when I begin to make something out of nothing. I don’t know what I am doing but I trust the process to reveal to me just what I need to know to follow the spark of an idea to its fulfillment and consequently to my fulfillment. This is Art Making. I have never been so busy with my work nor have I ever been so driven. I mean I drive myself really hard. Is it this year 2012? Is it the sign of the times? Is it that I am realizing that I have a limited time here on earth? I don’t know but I am exploding with ideas and dreams and I am doing my best to manifest all of them. My friend Diane Ericson (amazing fabric artist) said to me recently “just because I think of an idea, doesn’t mean that I have to do it”. I keep reflecting on this statement as I am racing the clock to get everything done that I have set up for myself. When something comes into my head to do, I think of Diane’s comment and I want to let it go and not do it, but instead I think of how cool it would be to do it and so it begins. I am driven to create the images and ideas that come to me. My husband is used to this fact about me. I can see it on his face when I say “you know, I was thinking…”. He is thinking uh oh now what does she want me to do. But he is always a good sport and he does his best to accommodate me and my ideas. The Story Art idea has been with me for a while. I didn’t want the text or story to be on the wall with the art like I usually do. So I came up with the idea to create a book to go with the exhibit, and I wanted it to be a nice hand-made – artist-made book. And this means me. First I had to finish the art work then come the stories. Boy, I can tell you I can get very cranky when I am working on a story and it hasn’t come into focus yet. Some stories are right there, easy, given to me like a gift. Others I really have to work for. It’s like the image is trying to be clear but I am thick headed and pressured by the timeline. Oh I can tell you this is so uncomfortable and anxious and itchy. It is enough to make me want to holler “why me! Why do I do this to myself” and then run like hell away from being an artist. Then I remember It’s not about me, it’s about the art. Its the art that is trying to realize it’s self. Art really does have a life of it’s own that is independent from me. I did say yes to art and doing my best by it. After all, I absolutely love the art of making . even though I make lots of mistakes, my imagination and drive to create something that isn’t, – is enough to carry me onward to whatever my goal is.